Ria is a main character in the story AilAid. Here real name is Huria and goes by the shorter version, she is young, inexperienced and somewhat naive. She is far over her head in the survival situation she finds herself in. She is a Comm Officer who is in charge of somewhat of an administrative assistance to the colony leader Raislaw. Because of her work and access to many files she is aware of the population dying during the ‘Marking’ phenomena. She is one of the three survivors along with Bray who has been ‘Marked‘ and Dix the guard. She is somewhat small framed, has long, light colored hair and always wears a ribbon. She would be around 19 years old. Ria is very logical and somewhat detached from her feelings. She thinks in a linear, staccato fashion and her mental state could be described as ‘cold’ but externally very open and friendly. During AilAid it is obvious they need to put in a distress call and only Ria is capable of it. They come up with a plan to fight their way to the Comm room to have her do it. The entire time Ria starts to have increasing visions of a man’s life. First it is a little boy she ‘saves’ by repositioning his feet as he is about to fall out of a tree, leaving him facially scarred but still alive. Later he is older and a soldier who she saves but small little things like a misstep here or there that saves him. They are attacked and something strange happens to Ria when she starts to hear voices in her head. She becomes disconnected from her mind as her body reacts in this hyper-skilled way of an ultra-elite soldier who can see through time. The young girl racks up a huge kill count on the strong aliens, the question though, is how did this happen, and what does it mean? 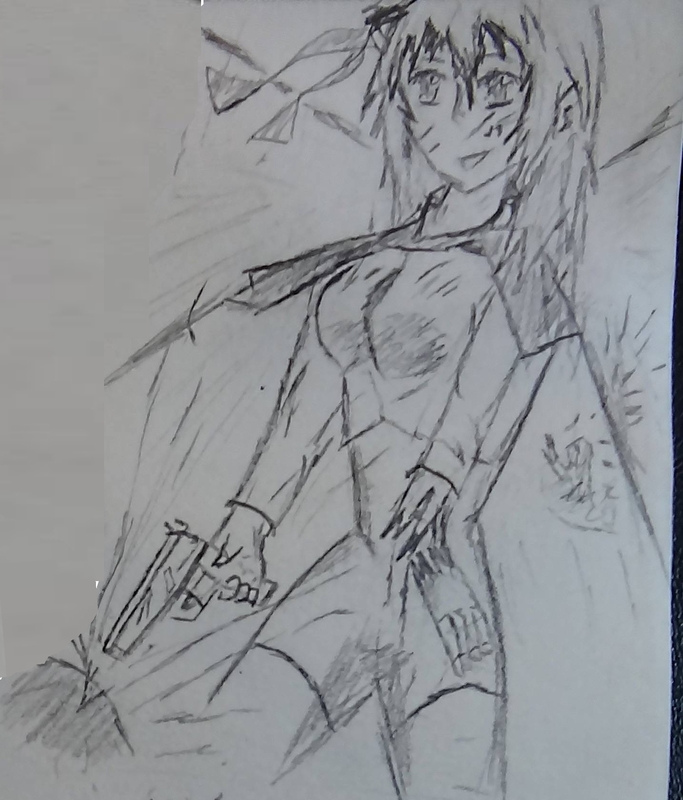 Ria uses a Flechette Thrower pistol as her main weapon. It is considered a high-end civilian weapon. After AilAid, the events that occur made Ria well-known in deep intelligence groups for her very odd behavior and abilities. A few know why it happened but keep it secret. She mentions that one of the names of the man she see’s in her visions goes by the name Raist. This is in fact the same Raist from Project: AKRA. It is revealed that Ria is a ‘Guardian’ which appears to be an extra-dimensional entity that is constantly resurrected ‘into life’ and is bound with another energy that they guard each other as they go through life. Ria’s possession was this high dimensionality stepping in to avoid her being killed. Ria becomes Marked/Line Poisoned by the end of the story from her living on the planet near a Line Spring. It is also unique as she lives a long life – not being killed by the creatures that killed the colony in the story. She mentions ‘Raist’ as the name of a male she ‘guards’ during her turn, this is Raist from Project: AKRA.